In this paper, control methods for achieving collisionless walking of robotic underactuated walkers are discussed. Collisionless walking is a gait type of motion that does not cause collision during the landing of the swing-leg end. First, we introduce a simple point-footed walker and develop its motion equation. Second, we propose two time-scale output deadbeat control approaches and demonstrate mathematically their ability to generate a stable, collisionless walking gait. Overcoming potential barriers at midstance as well as the stability of zero dynamics are guaranteed accordingly. Furthermore, we investigate fundamental gait properties through numerical simulations. F. Asano, Y. Zheng, and X. Xiao, “Time-Scale Control Approaches to Collisionless Walking of an Underactuated Rimless Wheel,” J. Robot. Mechatron., Vol.29, No.3, pp. 471-479, 2017. E. R. Dunn and R. D. Howe, “Towards smooth bipedal walking,” Proc. of the IEEE Int. Conf. on Robotics and Automation, Vol.3, pp. 2489-2494, 1994. M. Rostami and G. Bessonnet, “Impactless sagittal gait of a biped robot during the single support phase,” Proc. of the IEEE Int. Conf. on Robotics and Automation, pp. 1385-1391, 1998. M. W. Gomes and K. Ahlin, “Quiet (nearly collisionless) robotic walking,” Proc. of the IEEE Int. Conf. on Robotics and Automation, pp. 5761-5766, 2015. E. R. Westervelt, J. W. Grizzle, C. Chevallereau, J. H.	Choi, and B. Morris, “Feedback Control of Dynamic Bipedal Robot Locomotion,” CRC Press, 2007. F. Asano, “Fully analytical solution to discrete behavior of hybrid zero dynamics in limit cycle walking with constraint on impact posture,” Multibody System Dynamics, Vol.35, Issue 2, pp. 191-213, 2015. F. Asano and X. Xiao, “Output deadbeat control approaches to fast convergent gait generation of underactuated spoked walker,” Proc. of the IEEE/SICE Int. Symp. on System Integration, pp. 265-270, 2012. T. McGeer, “Passive dynamic walking,” Int. J. of Robotics Research, Vol.9, No.2, pp. 62-82, 1990. 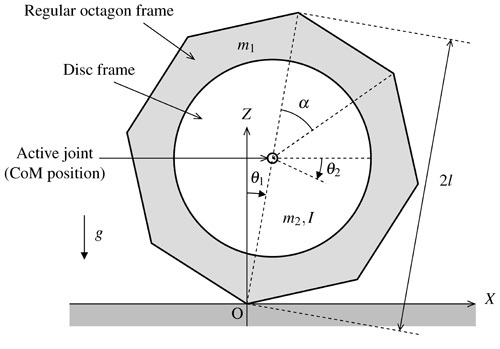 M. J. Coleman, A. Chatterjee, and A. Ruina, “Motions of a rimless spoked wheel: a simple three-dimensional system with impacts,” Dynamics and Stability of Systems, Vol.12, Issue 3, pp. 139-159, 1997. A. Goswami, “Postural stability of biped robots and the foot rotation indicator (FRI) point,” Int. J. of Robotics Research, Vol.18, No.6, pp. 523-533, 1999. M. Vukobratović and J. Stepanenko, “On the stability of anthropomorphic systems,” Mathematical Biosciences, Vol.15, Issue 1-2, pp. 1-37, 1972.